The school has achieved 100% result in their Grade 10 CBSE Board exams all these six years. 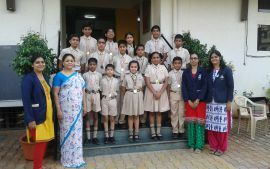 The school has achieved laurels by achieving many State and National Level Competitions in various Olympiads like National Science Olympiad etc. The School took part and achieved success in the State Government Scholarship exams for Grade 5 & 8. The students are encouraged to take part in Homi Bhabha Science and National Talent Search exams. The students have scored many interesting awards in the National Level Mathematics exams. The students have achieved National level Prizes in the creative sector too like the folk dance and Western Dance. The students embarked their musical journey where they have achieved first in the National level singing competition. The school encourages various district and State level competitions in Tabla, Synthesizer, Chess, Taekwondo etc. and not to forget the interschool trophies that is given as Best Participating School in almost all the events that it took part. The school has a separate administrator to look after the same. The small children are helped by the lady attendants while they embark the buses. They are attended with tender care and love. It is not an exaggeration if we say that the students miss their bus moushis during vacations. 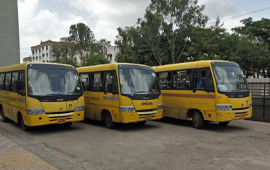 The drivers have badges given by the RTO and all the buses are RTO approved. The safety norms like grill doors, speed governors etc. are all vigilantly followed in the buses. The attendance of the students for the buses is well maintained with the help of an in charge teacher per bus. The route maps and first aid kit are fixed in the buses.